Heat grill. Cut steaks into 1-inch-wide strips. Place strips in shallow dish or resealable plastic bag. In small bowl, combine all remaining ingredients; mix well. Pour over strips; toss to coat well. Cover dish or seal bag; let stand at room temperature for 15 minutes to marinate. When ready to grill, remove steaks from marinade; discard marinade. 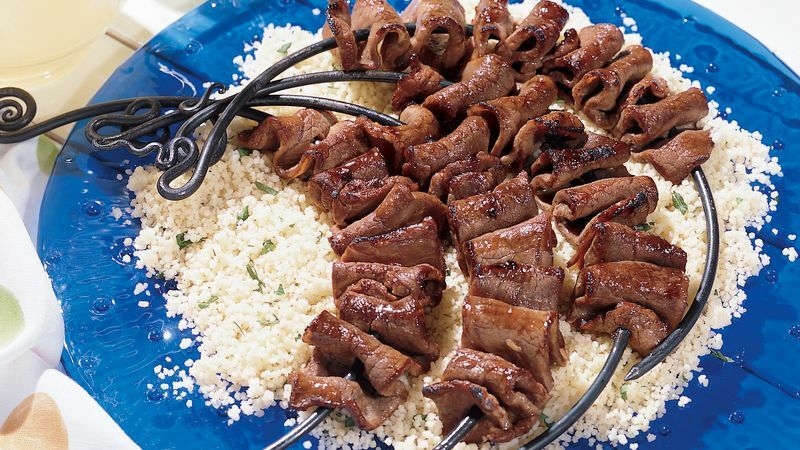 Thread steak strips onto four 10 to 12-inch oiled metal skewers. Place skewers on gas grill over medium heat or on charcoal grill 4 to 6 inches from medium coals. Cook 5 to 7 minutes or until of desired doneness, turning once. • Cut ingredients into same-sized pieces for even cooking. • Skewers with flat sides (rather than round hold ingredients more securely. • Soak bamboo skewers in water for 30 minutes before use so they won't get singed. • Give longer-cooking fod such as potatoes a headstart by partially cooking or microwaving them briefly. • Skewers must be turned for even grilling. Use hot mitts and long-handled tongs.